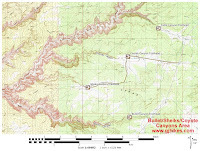 Sheiks Canyon is located in the Grand Gulch Primitive Area of Cedar Mesa near Blanding, Utah. 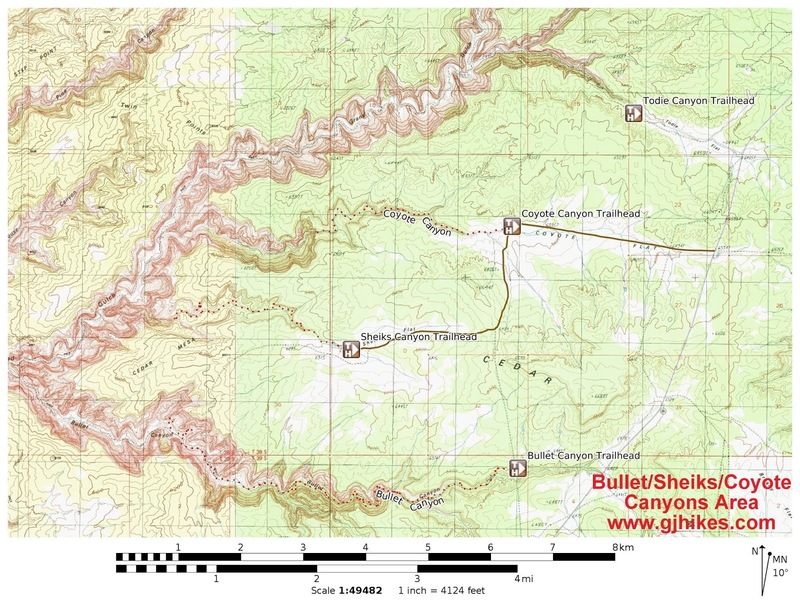 While the canyon provides access into Grand Gulch it is a less popular route than its neighboring Bullet Canyon. 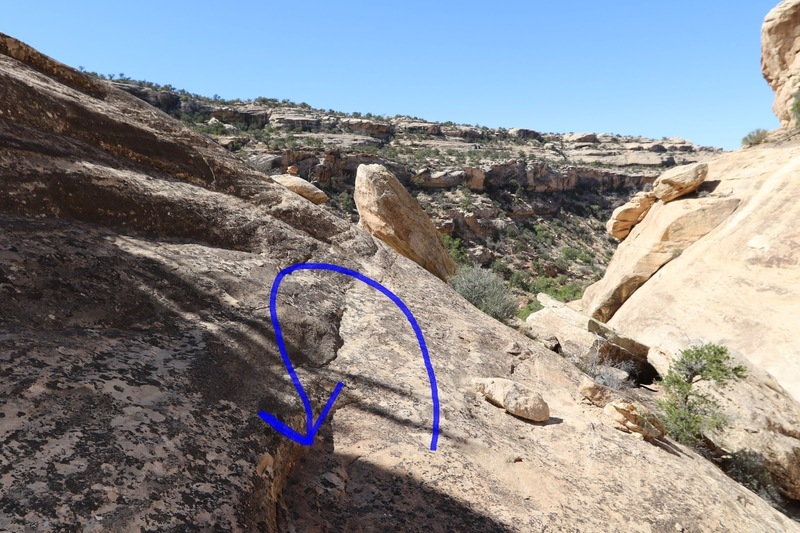 The Rangers report that they have had several rescue missions in Sheiks Canyon and consequently don't recommend it as a route into Grand Gulch. That said, there are several ruins in the upper section of the canyon that are well worth visiting and only moderately difficult to reach. There are 2 routes to the trailhead. One is via the Bullet Canyon Road and the other is using San Juan County Road 250. 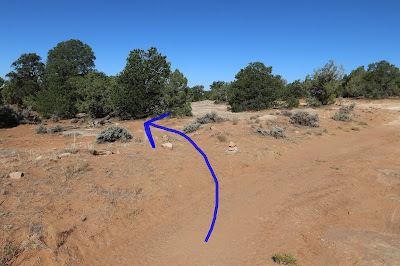 This posts follows CR #250 by driving south on UT-261 measuring 4.6 miles from the Kane Gulch Ranger Station. The sign in this photo mentions that the road is impassable when wet but some vehicles might also have trouble in a few sandy spots when it is dry. After turning onto CR #250 it is another 4.6 miles or so to the trailhead depending upon how close you are able to park. From the highway follow the dirt road as it cuts across Coyote Flats for 2 miles where it turns sharply to the left and crosses a wash. The spot where it crosses the wash has a big dip that will stop most low clearance vehicles. Continue for another mile where CR #250 turns to the right. Going straight at this point leads over to the Bullet Canyon trailhead. Keep going on CR #250 for another 1.5 miles and you will come to some very rough slickrock domes that require a high clearance 4-wheel drive vehicle to cross. This is the typical place that most people will want to park even if their vehicle can handle what's ahead because it is only another couple hundred yards or so to the end of the road. At present there isn't a trailhead sign for Sheiks Canyon but it is pretty easy to pick up the trail that is marked by a couple of cairns. As the trail starts out there is a nice well worn path that travels along the left side of the wash that is faster and easier to hike on than the wash itself. Eventually that route enters the wash as it begins to get deeper. There are a few boulders choking the wash at this point that require a little scrambling but nothing major. Just past the boulders is a little spillover. This photo was taken from the bottom looking back at a shelf that we ducked across. The shelf slopes down at an angle to a spot where you only have to step down a foot or so to get off of it. If there is a pool of water at this spillover you might have to go around it a little further to the right and find a suitable place to climb back down into the wash. If you parked in the typical spot and began hiking you should reach Yellow House Ruin somewhere around the 0.6 mile point. The well preserved ruin sits above the canyon on the right hand side on a small bench. This is the most significant ruin in the upper area for Sheiks Canyon. You could turn around at Yellow House but the hiking is pretty easy if you would like to continue on to see some nice granaries. There are several routes from Yellow House Ruin that lead back down into the wash. As you continue past the ruin you might notice a partial section of wall high up on the right side that is tucked away beneath a small overhang. A little over a quarter mile from Yellow House Ruin is another nice granary that sits just above the wash under another overhang. Within the next half mile or so is another granary that you won't be able to see from the wash. We were hiking by a spot that looked promising and after hiking up some steep terrain we found a nice looking granary along with some other minor ruins. Near the 2.2 mile point from where we parked there is another ruin visible high up above the wash on the right hand side. It is a bit of a scramble up a steep slope to get up to it. If you do make the climb up to the ruin you will find another very nice granary along the cliff to the right as well as some minor stuff in a few other places along the cliff. Continuing down the canyon the trail comes to a spring where the difficulties begin multiplying. There are some shelfs and spillovers that require scrambling over to get below the spring. Right before the canyon makes its big plunge to get down to the level of Grand Gulch there is a section of sloped slickrock that has more exposure than some of us wanted to deal with and that is where we ended up turning around. The turn around point was about 2.9 miles from where we parked. There are a few shards of pottery here and there in Sheiks Canyon. We didn't spend all of our time looking for it but we did notice this large chunk of gray and a few smaller pieces of corrugated. Be sure to put anything you find back where you found it so others can also enjoy it. And remember that it is illegal to dig for artifacts or to disturb archeological sites in any way.